Noni Juice helps bring balance and energy to your body. Noni juice has a LOT of claims, but this is not unusual for a lot of "miracle cure fruits"
• Immune System: Noni strengthens your immune system's natural ability to fight disease and infection. • Circulatory System, Tissues, and Cells: Noni is a superior antioxidant that helps rid itself of harmful free radicals, and also increases energy levels. • Digestive System: Noni supports proper digestion which helps the body absorb more nutrients at the cellular level. Other helpful benefits you may notice include extended mental clarity, increased attention span, and greater physical performance. Other study proved Noni’s analgesic (anti-pain) properties. • Noni has unique anti-pain effects. • Noni inhibits pre-cancer function & has been found to inhibit the growth of cancer tumors. 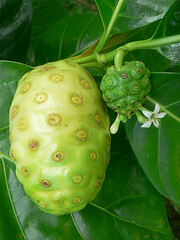 In traditional Polynesian medicine, noni fruit (Morinda citrifolia) has been used for many health conditions, such as constipation, diarrhea, skin inflammation, infection, and mouth sores. It has an unpleasant odor and taste, so it is believed to be a last resort fruit by many cultures. Noni fruit, like many other fruits, is a source of vitamins, minerals and antioxidants. The antioxidants may help to prevent certain diseases and help slow age-related changes in the body.